PILEJE PROTEOCHOC 36 CAPSULES based on Porphyral®: The food supplement Pileje Protechoc promotes an effective recovery in case of shock or in support of physical stress (major effort, important sporting event, burn ...). This dietary supplement allows you, thanks to Porphyral®, to preserve your body in case of shock. It acts as a true cell and tissue repairer . Porphyral® , derived from a food alga, the red alga Porphyra , produces "anti-stress" substances, also known as shock proteins . This shock protein or HSP protein is naturally produced by the body to speed up recovery, in response to the various assaults of our environment. 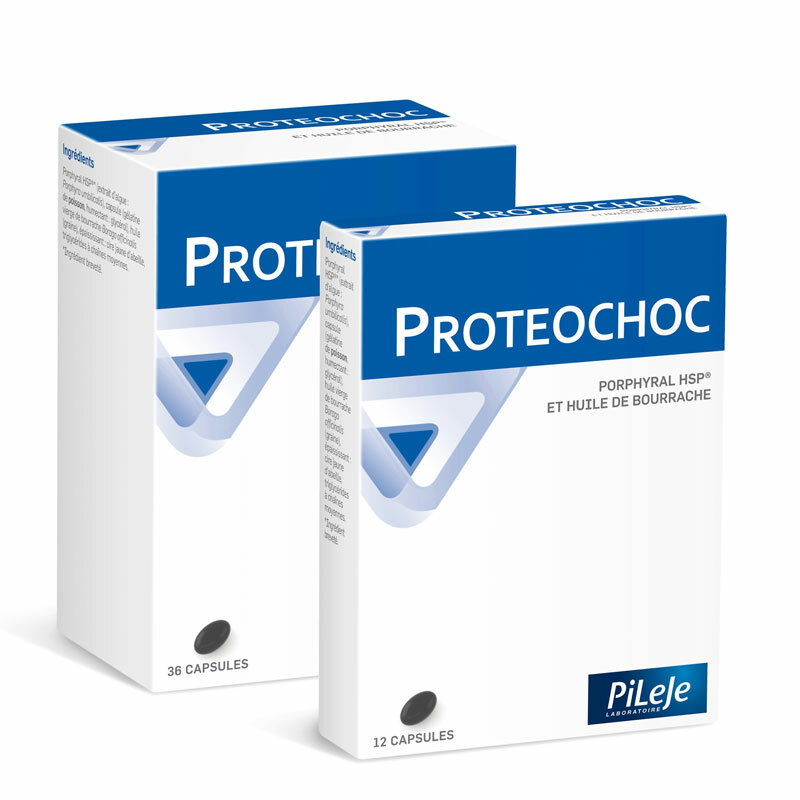 The food supplement PROTEOCHOC therefore allows a significant contribution of protein HSP , which increases the defense of your cells against the aggressions of our environment, using this natural mechanism. Your body is protected significantly. Proteochoc can be used during more or less intense physical exercises, for preparation and recovery, or simply to strengthen your defenses. 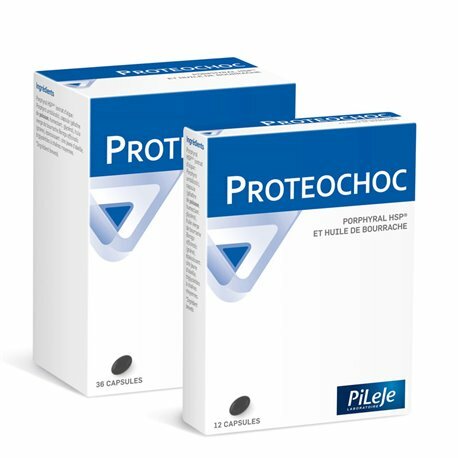 Comment on the advice of use and dosage of Proteochoc Pileje in pharmacy with our partner Avis checked after your purchase. Take 4 capsules for 3 days or 9 days depending on the trauma to be overcome. Example: Before surgery by general anesthesia or delivery : take four capsules the day before and continue for the next 8 days. Porphyral HSP (Patent Ingredient) (Algae Extract: Porphyra Umbilicalis ), Capsule (Fish Gelatin, Humectant: Glycerol), Virgin Borage Oil Borago Officinalis (Seed), Thickener: Yellow Bee Wax, Medium Chain Triglycerides.